It’s that time of year for us in Tampa Bay and I have been busy. I finally have a little break to leave a report. Fishing has been on fire. The bait has started to show up around our area bridges and so have the fish. The Spanish Mackerel have invaded our area with vengeance. We are catching good numbers of mackerel using live scaled sardine (aka greenbacks) on a 40 lb Berkley Trilene fluorocarbon leader and a long shank hook. Spanish mackerel have razor sharp teeth and can easily cut through any leader. I like using the long shank hooks because it helps reduce cut offs. The Trout and Redfish bite has been awesome. The key to catching good numbers is bait. Make sure you have a livewell full of scaled sardines and you are sure to have a good day. We are fishing a school that is producing a good amount of keepers and oversized fish. 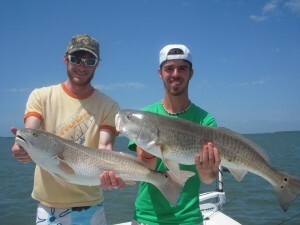 Our limits on Redfish in Tampa Bay are 18″-27″. It’s not uncommon to catch more over slot fish than keepers. It’s a good problem to have, if you ask me. While fishing the Redfish schools, we are running into some good Trout. I had a client hook what I thought was a Snook but to my surprise, it was a monster 28″ Trout. A Trout that size in Tampa Bay is a trophy size fish. Most Trout caught in Tampa Bay are between the sizes of 15″-22″. It was nice to see a Trout that size and that healthy. It’s a good sign for the Trout species in the Tampa Bay area. Tarpon have started to show up. Stayed tuned for a report.